The Appendix is one of my favorite history publications. It’s a digital journal started by a group of UT Austin students several years ago, when they decided to create a venue for historians and journalists to share the quirky “extras” of their work—stories that didn’t quite fit in to a traditional academic publication but were too good to let pass untold. As the About page at the site says, “though at times outlandish, everything in its pages is as true as the sources allow.” The Appendix also encourages authors to get creative in how they tell their stories. So, for example, my friend Maggie Greene has written the history of a Chinese ghost story in reverse, beginning in 1981 and concluding in 1381; and a former tour guide has related the complex history of Philadelphia’s Eastern State Penitentiary, which I’ve been intending to visit for years but still haven’t. The piece that I wrote for The Appendix earlier this year, which just went online yesterday, isn’t quite so unusual, but I’m not sure another publication would have accepted it. 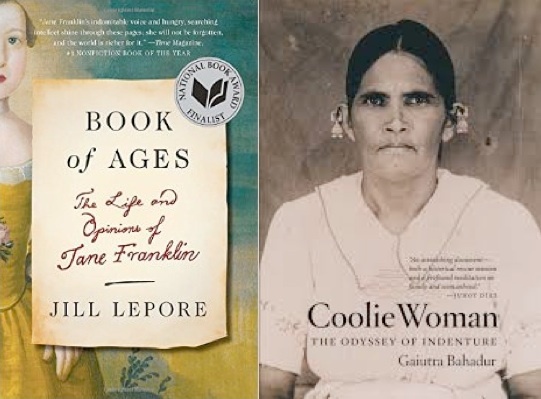 “Thinking Outside the Archival Box” is a review essay, which pairs two books that might seem to have little in common: Book of Ages, Harvard professor Jill Lepore’s biography of Jane Franklin (Ben’s sister), and Coolie Woman, in which journalist Gaiutra Bahadur uses her great-grandmother’s story to relate the history of Indian women who traveled to Guyana as indentured servants. Most academic journals wouldn’t let a specialist in Chinese history write about two books so far outside her field, or permit her to bring together two seemingly so different books in the same review. But that’s the kind of thing The Appendix encourages—luckily for me, since I think we can learn something by looking at Book of Ages and Coolie Woman side-by-side. Check out my essay here.